Our vegetable garden is finished, and while some of the plants are looking alarmingly limp and yellow, others seem to be thriving. Regardless, the girls and I are finding gardening to be great fun, and we decorated our garden yesterday with these adorable garden stakes. We found the blank plastic stakes for cheap at our local hardware store. I drew simple vegetable shapes on construction paper which E helped to cut out and A helped to glue on with mod podge. When the glue dried, I gave the labels a good coating of clear gloss spray paint. I love how colorful and hopeful they look out there: the promise of a bountiful harvest... so long as I can keep the plants alive! I've come to love Zoe Hall and Shari Halpern (illustrator) for preschoolers. Their books are simple, fun, and so engaging for little ones. Together they have written several books, all of which explain something about nature to small children. In The Surprise Garden three children plant different "mystery" seeds in their garden and wait to see what grows. 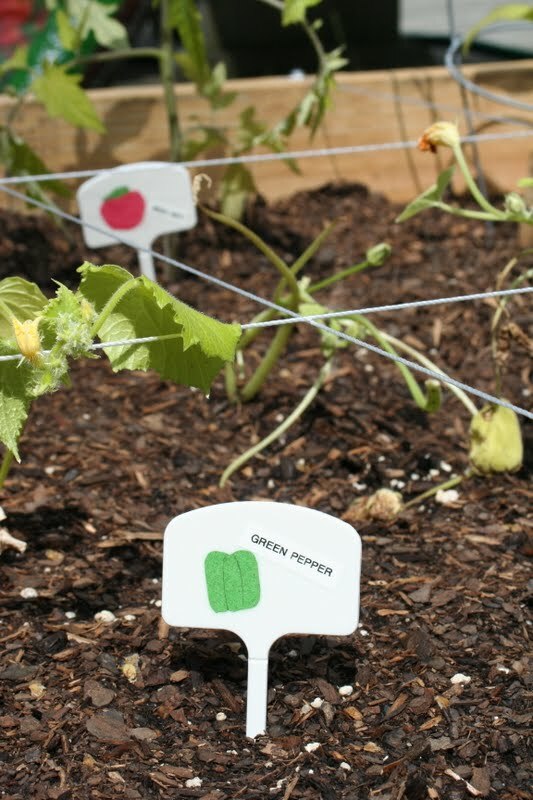 They sort and plant their seeds and mark each type with a different colored stake. Then they carefully water and tend their garden, watching the various plants sprout and grow. In the end they have an amazing harvest of fruits and vegetables: all gorgeously illustrated in Halpern's cut-paper collages. I'm jealous of your garden. I can't seem to keep any type of plant alive. I love your stakes! So cute! I adore those garden stakes. Y'all did a great job. So glad I found your blog! I'm loving it. Kids' books, gardening...I think I've found a favorite. I miss your posts :) I hope you are all doing well and settling in to the new house.